Dad was working, but Mom was laid off. As she looked for a job, the bills were piling up fast. Then came the utility shutoff. And the eviction notice. If you were to speak to their young daughter, what would you say? Would you tell her everything is going to be OK? Would you tell her you want to help? Fortunately for this young family, our community did help. Sponsors of our annual Homeless No More event last year ensured Volunteers of America Michigan was able to continue as a champion of the homeless, the hungry, the forgotten in the Lansing area. For people just getting by, a broken-down car or illness can throw their fragile lives into chaos. But there remains a light of hope. It is found at the VOA. And Homeless No More keeps that light shining. Join us 5:30 p.m. Tuesday, February 13th at the Kellogg Center in East Lansing. This is a fun networking event with strolling buffet and cash bar. We'll meet friends old and new, and know that we are making a difference in the lives of our most vulnerable neighbors. You also can download materials here, or call Renee at 517.489.5278. 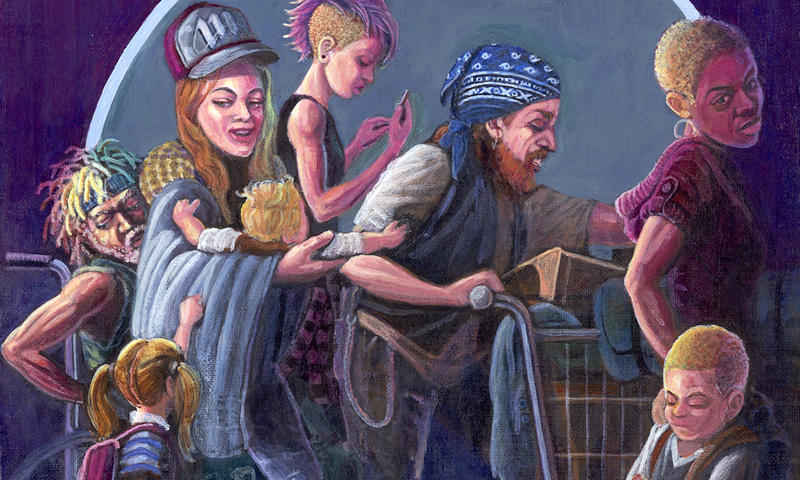 This is a detail of "Homeless No More," an original painting by artist Reuben Kenyatta, donated to help promote the event. Learn more about his work.